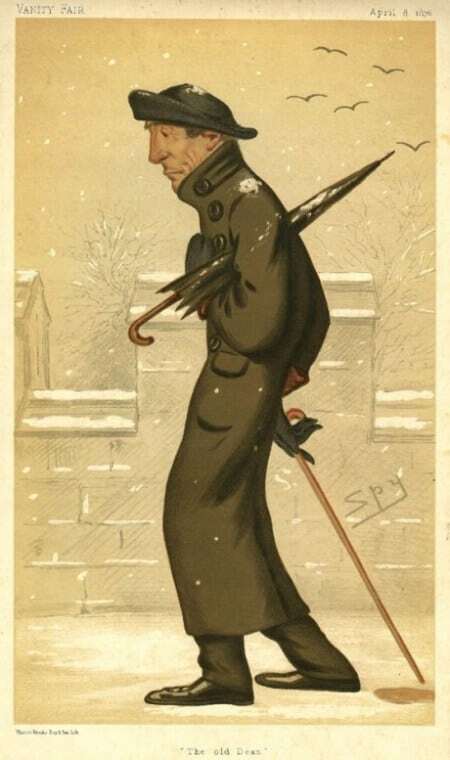 Published in “Vanity Fair” in 1876, this Spy cartoon, entitled “The Old Dean”, depicts the Honourable and Very Reverend Gerald Valerian Wellesley, Dean of Windsor, in a wintry scene. Armed with a walking stick and (folded) umbrella he trudges through the snow beside the walls of Windsor Castle with an air of resignation. Contemporary readers of the magazine would have had no difficulty in recognising the subject of this caricature since Dean Wellesley was a national figure. Because of his close friendship with Queen Victoria and his good relations with Prime Minister William Gladstone, who was vehemently disliked by the Queen, the Dean was frequently called upon to act as their adviser and go-between. The cartoon which is held by St George’s Chapel Archives [SGC F.61] is one in a long series of caricatures drawn by “Spy” (Leslie Ward) for the magazine “Vanity Fair” – his signature can be seen on the right hand side of the picture. From 1868, “Spy” and fellow artist “Ape” (Carlo Pellegrini) produced a steady stream of “antiportraits” for “Vanity Fair” – big-headed comic figures generally drawn against a blank background. The cartoon of Dean Wellesley, with its Windsor Castle setting, is unusual in this respect. With titles such as “The Old Dean”, “A Persevering Politician” and “A Sporting Lawyer” they fell short of naming their subjects, but readers were left in little doubt as to their identity. Indeed, their anonymity was part of the fun. In 1876, when “Spy” portrayed him, Dean Wellesley was 67. He had been serving as Dean for twenty two years, since June 1854, and had been a great support to the Queen after the death of her beloved Albert in December 1861. Indeed, Victoria paid this tribute to Dean Wellesley that he did ‘everything on all sad and happy occasions to make me comfortable’. She was deeply saddened that he chose not to be buried in St George’s Chapel on his death in office in 1882, preferring the humbler location of Stratfield Saye parish church where he had been Rector prior to his Windsor appointment. In considering the appointment of his successor, Victoria declared her desire for a ‘good kind man without pride’ – an apt description of the recently departed Dean.